If you’re a woman, or you’re a man with a woman in your life, it’s important that you know why women need friends, most importantly women, to optimize their health! When men and women get stressed their bodies create the hormones adrenaline, cortisol and epinephrine causing a fight or flight physical and mental reactions. Prolonged high levels of these stress hormones increase the risk of cancer, heart disease, heart attack and stroke, as well as, structural alterations in the brain’s memory. When women feel stress we innately feel the urge to “befriend and tend”, reaching out to those nearby to nurture or connect with. A 2002 UCLA study, Friendships Among Women showed that when women socialize and connect with other women they experience a calming effect due to the release of the hormone oxytocin, which is further enhanced by the simultaneous release of the hormone estrogen. Men do not experience this calming release from connecting. Oxytocin also causes women to bond with those she experiences this connection with. Another study by David Spiegel found that among a population of women with breast cancer, those who had strong, supportive friends outlived, by many years, those women who lived in social isolation. A Harvard Medical School Study found that the more friends women have the less likely they are to develop physical impairments and chronic diseases than socially isolated women. The study further showed that not having friends or confidants to reach out to equates to a woman’s health as being overweight or smoking cigarettes. The researchers examined how well women functioned after the death of a spouse or partner, one of life’s greatest stressors. They found that women with close friends to share their burdens with fared far better than women who lacked close friendships. These and other studies show that women who regularly socialize with other women reduce their risk of disease by lowering blood pressure, heart rate, and cholesterol. According to a statement from The American Heart Association in the February 2017 issue of Circulation, Acute Myocardial Infarction In Women, one in three women die of heart disease, stroke, and other cardiovascular problems. 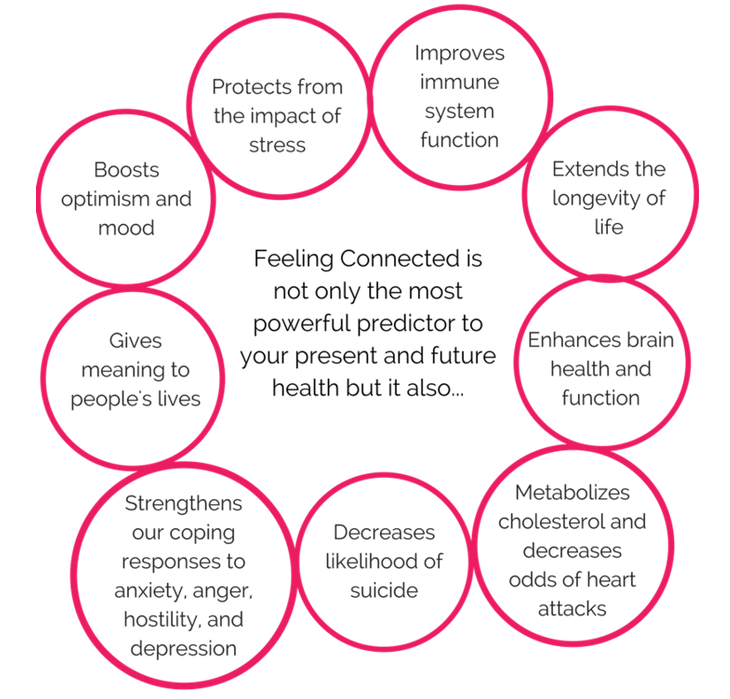 Dr. Ornish emphasizes in his article, Women and Heart Disease: Three Days Can Change Your Life, that taking time each day to make and celebrate a connection is a key component to living a healthy, happy and long life. 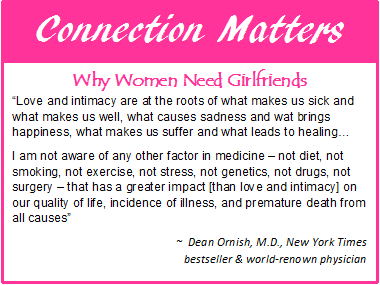 Women who regularly connect with their friends receive many benefits from these close intimate relationships. This is a great indicator of their quality of life and health. The image to the side here shares just a few of the benefits women get from connecting regularly with friends. As young women in our teens and through our college years, our girlfriends and close friendships are an important part of our life. However, as we move into other phases of our lives we tend to disengage with our girlfriends and close friendships. Women first disengage with their friendships and social networks in an attempt to reconcile competing obligations with work, family, community and self-care. In Ruthellen Josselson’s book Best Friends: The Pleasure and Perils of Girls’ and Women’s Friendships, she explains that when women get busy with the demands of work and family, their friendships are first to be pushed away due to their lack of resources in time and energy to maintain them. As women move into different phases of life, or life changes, we disconnect with old friends in search of new friends who can better support and understand our new-found circumstances. For example, when: your marital status changes from single to married; you become a new mother; you lose a spouse, a child or another close loved one; your last child leaves home and you become an empty-nester; you’re newly divorced; you’ve decided to get sober and need to change your friends. Our fast-paced high-tech, low touch 21st century lifestyle has had a significant impact on reducing the face to face time we spend with those close to us. Other situations causing women to disconnect with friendships include a relocating to another area, state or country, a change in profession, an illness and there are more. The problem is that when women need the support and listening ear of close friends we may minimize our need to do so. But, reaching out to connect is exacting how we are created to handle life’s stresses and burdens. We were never meant to carry these burdens alone. We need to realize the strength, support and healing benefits we gain from developing and nurturing these relationships. Let’s face it, there are a lot of things men don’t understand about us women. But I do believe that the men in our lives want us to be happy and healthy. Research shows that both men and women need healthy personal relationships with others to live a long, healthy, fulfilled life. However, men respond to stress by leaving the situation, fighting or taking action, or bottling up their emotions. So a man deals with stress by isolating himself in his man cave and watching an action-packed movie. Or, he’ll join his buddies for a football game. It is the escaping and action experience that relaxes him. His friends are sharing the experience with him. Before I shared this blog information with my husband he didn’t understand why watching his action movies didn’t relax me like it did him. 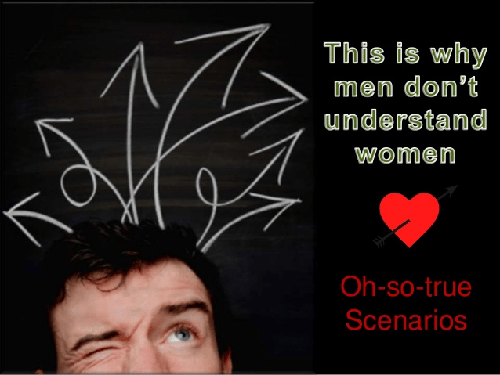 Now he understands that men and women are wired differently. action movie time is to him…Now he gets it! Are you a gal searching for a way to meet more girlfriends to connect with? Here are some ideas for connecting! Say YES! When someone invites you out. Pursue that hobby you love so much! Go to church, temple or another spiritual enrichment or personal development community. Use your kids, your dog or borrow someone else’s to connect. If you enjoyed this post, Why Women Need Friends To Optimize Their Health, share and/or comment below!